Care comes after planting - that's for sure! And the better you did the first thing, the better and easier is the care of your precious plants, rhododendrons en azaleas and other plants. If we understand what they need it is not so complicated to take care of them. In the table on the left side below you will see the main aspects, which play an important role in an appropriate care for many years. If you have taken the right measures in planting the rhododendrons and azaleas, this investment will pay itself back! Again my advise is, to read these comments and instructions at your leisure. If you want to enjoy for many years to come, your rhododendrons and azaleas you have to put some efforts in the necessary care. Generally speaking rhodos and azaleas are quite easy plants, the more as you have planted them with care and don't neglect them afterwards. I have seen too many plants, also in public parks with yellow leaves and looking as if they would say:"Please, look after me and see how badly I am growing". For a real gardener with love for his plants his garden is for work and enjoyment both. I wish you a lot of pleasure with your 'work'. When we plant rhodos and azaleas in our garden, we have to consider how they grow in their original natural environment. So we have to imitate their growing conditions as well as we can. Just watering now and then has no sense. If we have taken the right measures in planting the plants, we will have to see what happens. In nature the plants and trees provide themselves with the needed layer of mulch materials, thus keeping the soil moist and cool. In our garden the conditions as we started are different. Mulching and watering are coherent things,. Therefore we must take care of the plants in hot periods and in cold times. In summer watering is an important thing to do. If we mulched well, the soil will be moist and relatively cool, but after a long period of dry and hot weather tha plants can give a sign, that they need water. 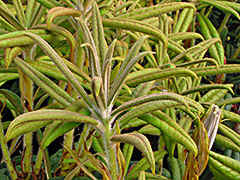 Especcially when the rhodos have new leaves, they will wilt, showing their need of water. If this is still the case early in the morning, they need water, that's clear. As I told before, it is necessary to water not just a bit, but so long, that the whole rootbal is moist, but not excessively to avoid thet it is soaked with water. This will cause root rot diseases. In some regions fall can be very dry and the plants must be watered before winter to replace water lost from the leaves and be prepared for cold dry winds during frost. Rhodos and azaleas, planted near some trees like birches and firs need extra water. they have a shallow root system and are competitors for water. They need extra care and attention. This is also true for those plants which are in full sun for the whole day. You must realize, that it is difficult to water a rootball that is completely dry - using a dripping system is a good solution. Building a berm around the plants can prevent the water to soak away. The message is: do not wait too long to take the right measures for watering and mulching. All living creatures, people, animals and plants - need their food, nutrients. So also rhododendrons and azaleas. But what, and when and how much? Especcially in the growing season the plants need to be fertilized. New plants don't need too much fertilizer the first growing season. And if you mulch well, the mulch will provide the plants with what they need to a certain extend. Note, that overfertilizing can burn the roots which can cause diseases. So, be moderate in fertilizing; as long as the plants grow and look healthy, they don't need that much. I apply inorganic fertilizer in a mixed combination of NPK 12-10-18, a general fertilizer. N stands for nitrogen, P is phosporus and K is kalium, potassium. I will not go into details, but this combination works well for me. Never fertilize first and then mulch. Always over the mulch. The root system of rhodos and azaleas is quite tender and fertilizer directly in contact with the roots is asking for trouble! Practice a so called split application - in March one half and later in June\July the other half. And fertilizing after July stimulater the growth too much and too long, so the plants will not harden off well enough. So, not later than July! 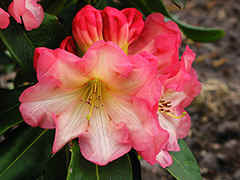 There are also special fertilizers for rhodos and azaleas, that's good to use. They also have magnesium, good for leave colour. You can also use rotted manure - I use it from chicken, but then in small amounts, because of the other salts in it. The advantage of organic fertilizer is, that it contains mostly many trace elements, good for a good growth of the plants. Understand that it is much better to apply in many times than everything in one time. Scatter the fertilizer in the droop line of the plants, not along the stems, where it hardly has sense and could damage the stem. Another way of fertilizing is, to use 'Osmocote' or simular trade marks. This is a fertilizer with a thin layer of resin or so, and it spends the fertilizer depending on moisture and temperature for 3, 6 or 9 months. It is quite expensive, but works well, especcially when you grow new plants in a greenhouse! There is much more to tell about fertilizers, but then you can better read special literature. Just one last hint about this:"It is better to use no fertilizer than too much! Definately as long a the plants look okay! 6. it adds organic matter to the soil and the roots can grow into it. Pine straw - pine bark (nuggets) - pine needles - wheat straw - peanut hulls - (decomposed) shredded oak leaves - wood chips - sawdust - grass clippings etc. You can use all these materials, but you have to keep in mind the particular (dis)advantages of each. If the material is not decomposed, like wood chips, leaves, grass clippings etc. they rob nitrogen from the soil to decompose. So, it is better to decompose first. Using just any leaves means, that they can blow away with the wind and make a mess in your garden. Shredded materials work better. Another important matter is how coarse or fine the material is. What we need, is a layer, thick enough to keep the burnung heat of the sun away and prevent evaporation of the water. Besides, in the mulching material there must be air enough for the roots to breath. So, all these considerations make me prefer shredded Pine and Fir bark nuggets of different sizes mixed up. Half of the pieces of about 1 to 2 inches, the other half about 3-5 inches. Another benefit is, that it must not be replenished every year, because the decomposing is quite slow. Grass clippings can mat and make rain drains away form the shrub If you want to use grass, weat straw, sawdust etc. you can better decompose it for a year and then use it. Ask around for local suppliers what they offer for what prices. You can use expensive materials for the foreground and and cheaper stuff for the background. But consider, that cheaper materials have a shorter longevity and must be replenished more frequently. So, what is really cheaper? And what looks better? I read an expression of somebody:"Organic matter is the magic elixir". Use it for your plants and yourself. Regularely I get questions about pruning rhododendrons and azaleas. They have grown too high or broad or gardeners want to prevent this. Moreover they grow more compact when you prune them. Well, we have to distinguish between pruning to give the plants a better shape or make them more compacr. Or we want a heavy pruning to resize the plants. Moderate pruning means, that after flowering time, May or June, we cut back the twiggs one year or even 2 years. Just look at the growth of the last year and cut back an inch or shorter above last whorl of leaves. Deadheading is also a form of light pruning as is that you break down the one growth bud when it is the only bud to expand. It will cause that the other dormant buds at the end of the stem will expand. All of these methods will not have a negative affect the flower bud set for next year. Heavy pruning is a different story. Sometimes it is better to replace the whole plant, when it has grown far too big or leggy. You have to consider what happens if you prune the shrub heavily. Doing this - early spring - in one time will face big consequences. Normally the shrub has a good cover of branches and leaves, giving the rootball shelter and shade. Now you are destroying this balance. After heavy pruning the large rootball has now a small top and can't spend all the water and nutrients to it. It is not in balance. It is better to prune in stages, this year the back half and next year the front back or reverse. Or this year the left half and next year the right half. And then you can have luck or bad luck. You also have to protect the surface of the rootball for the heat by mulching heavily. Even then it can fail. Most of the time the very small dormant buds along the stem will be stimulated to make new growth, but it can take several years that the shrub recovers and will flower again. Don't fertilize now or very little! Sometimes there is no regrowth on the branches but new shoots from the basis of the roodball. May be a better option for heavy pruning is to transplant a large rhododendron, but ii is not so easy. 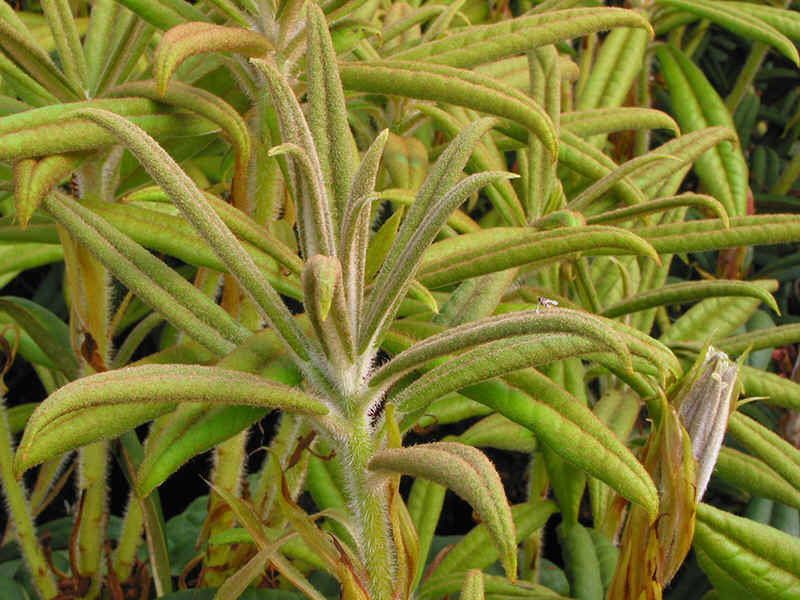 Actually it is a waste to mangle a nice large rhododendron, if you can transplant it. But how? You have to prepare a new place in the same way as for normal planting a rhodo. Try to dig out the rootball as large as possible, draw it on a plastic sheet and pull it to the new place. If this is not possible or too far away, try to get it on a wheel barrow with the help of some other people and drive it to the new place. The best time to do so is March\April and October\November when the plant is dormant. Take extra care for the right soil and mulch well. Don't fertilize in October\November and wait till next year May\June. The plant must get used to its new place and make new roots. 1. mulch!, and water when the plants show lack of water - it is hard to water a rootball that is completely drought out! 2. water long enough, that the whole rootball is moist, or use a drip system; don't overwater to avoid diseases. 4. don't overfertilize; mulch first, then fertilize, not reverse! (decomposed) shredded oak leaves - wood chips - sawdust - grass clippings etc. 9. heavy pruning in early spring this year 1 half, next year the other half; mulching needed! Don't fertilize now. 10. transplanting in spring or fall; take the whole rootball if possible; drag on plastic sheet; mulch!